Every spring when the great flood of migrating birds returns, they feast on the great flood of insects and other cold-blooded vertebrates returning at the same time. Let's look at some of the tiny critters that are emerging, and see what kinds of birds eat them. Robins are adapted to notice earthworms in their underground burrows, and pig out on them starting as soon as the ground thaws. American Robins specialize on worms, but eat insects that they find while searching the ground for worms. Like robins, this American Woodcock eats earthworms and large insects it finds on the ground. Which species gets worms deeper in the soil? How can you tell? Rose-breasted Grosbeaks, Scarlet Tanagers, many kinds of warblers, and other "canopy" birds feed on caterpillars that eat the leaves of trees. As soon as the tiny insects hatch, they begin feeding on the tiny soft leaves first opening up, and migrating birds arrive just in time for dinner! 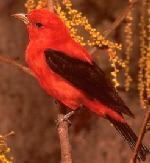 Scarlet Tanagers feed on insects in leafy trees, especially oaks. 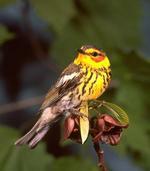 Cape May Warblers thrive on the budworms that sometimes infest spruce trees. Connecticut Warblers take a lot of their insects in the low branches of trees. They forage in dark, dense vegetation. Cerulean Warblers like this one are becoming rarer and rarer over most of their range in the eastern states, barely up to Canada. They eat insects in the very tops of trees. Swallows, swifts, nighthawks, flycatchers, some warblers, and Cedar Waxwings snap up insects flying in the air. Swallows, swifts, and nighthawks fly for hours at a time, snapping up insects on the wing. Flycatchers, warblers, and waxwings flutter out from a branch when they spot a succulent insect, and snap it up! These Barn Swallow chicks are being fed flying insects. This little Saw-whet Owl eats some big moths and other insects as well as mice. Big moths are fairly easy for little owls to catch in mid-air. This Tree Swallow is a master of the air, and even while staying in the same small area may cover hundreds of miles each day in its back-and-forth search for flying insects. Ducks, some shorebirds, kingfishers, and sometimes even crows, robins, and other songbirds pick at aquatic insects. Ducks can get them in deeper water than songbirds can, swimming underwater or dabbling in one spot to grab them. Shorebirds walk in the shallow water picking at them. Kingfishers fly above the water and suddenly snap their beaks to grab tiny fish and larger insects near the surface. Songbirds walk along the shore picking up insects that are pushed toward shore with the waves. This Eastern Phoebe is picking up insects on the mat of vegetation on the edge of Lake Michigan. Phoebes can also snap up flying insects from a perch. Killdeers are great at noticing insects and worms in grassy fields, but they also do a lot of feeding on the edge of ponds, lakes, and streams. 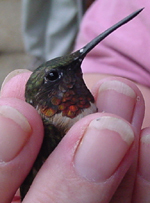 Hummingbirds get their protein by picking tiny aphids and other chewing insects from the surfaces of flowers and leaves, and by snapping up very tiny flying insects like gnats out of midair. Some people feed hummingbirds and small fly-catching birds by setting out chunks of banana and melon in a small mesh bag. Hummingbirds zip this way and that snapping up the tiny fruit flies that swarm about this kind of fruit. This tiny Ruby-throated Hummingbird can chase tiny insects in mid air, or can slurp them up with its long tongue when it sees them on flowers or leaves. Many birds feed on the big caterpillars, beetles, grubs, and other medium and large insects and spiders they find near the ground. Blackbirds, bluebirds, sparrows, crows, wrens, and other birds get a lot of protein by hunting out these bugs. Red-winged Blackbirds eat both seeds and insects. During the summer their main diet is insects, which they get on the ground, and by searching through weedy plants. This Eastern Bluebird is eating mealworms from a feeder. In the wild, bluebirds sit on a fence post or other perch and study the ground until they see a bug. Then they zip down for the kill! Towhees eat insects on the ground that they find by scratching at leaf litter. 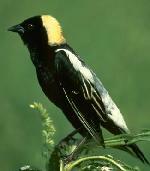 Bobolinks find their food in grass, weeds, and on the ground in meadows and prairies. In summer they eat mostly insects. Adult cardinals eat mostly seeds, but during the breeding season they spend time searching the ground and low plants for insects to feed their babies. Photo by Myron "Red" Newton. 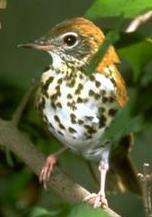 This Wood Thrush feeds mostly on the ground, walking in the leaf litter in a forest, pushing aside leaves with its beak to peek underneath for insects and other tiny creatures. Wrens investigate every corner of their little territories trying to find enough insects to feed their many babies (often 7 or 8 in a single clutch) and themselves. 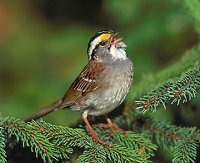 White-throated Sparrows may scratch at the ground like towhees. They also find insects in the branches of low weeds and shrubs. European Starlings walk on the ground and poke their beaks into the ground. Then they "gape"-that is, open their beaks to form a bigger hole in the soil to make it easier to notice insects. Chickadees, nuthatches, creepers, woodpeckers, and the Black-and-white Warbler find insect eggs, larvae, or pupae in the crevices of tree bark. 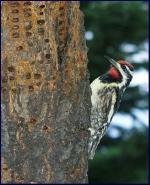 Woodpeckers can hear bugs chewing within the wood, and dig them out! Yellow-bellied Sapsuckers eat sap and berries, but also lots of insects that they hear chewing inside the outer layers of trees trunks. Chickadees eat many tiny insects that they find in tree bark. They also snap up crawling insects from leaves and inside weeds and grasses. 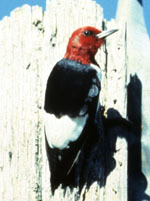 Red-headed Woodpeckers are also masters at pecking into wood to get the insects they hear chewing. Tufted Titmice, relatives of chickadees, take insects from many of the same places. Some birds can eat a wider variety of insects than others. These are called generalists. One example is the Yellow-rumped Warbler. Blue Jays use their intelligence and curiosity to figure out where bugs are in many places of their territory. They are omnivores who eat many plant items, too. This Yellow-rumped Warbler is versatile! It can eat little caterpillars on treetop leaves, can flutter out to snap up insects in midair, can visit bird feeders to take suet or mealworms, and in a pinch can even eat berries! Take your notebook outdoors, and spend 30 minutes searching for insects. Whenever you see a new insect, make a tally mark in the corresponding column in your field notebook. Which kinds of insects are you best at finding? What kind of bird's life would you be best adapted for? In your journal, write what your life might be like if you were that kind of bird. What new skills would you need? What skills do you have now that wouldn't help you as this kind of bird?